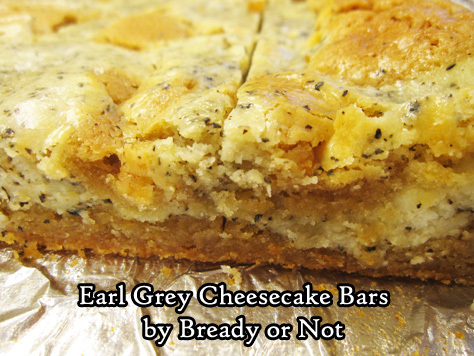 Earl Grey tea and cream cheese team up in delicious bar form in these delicious Earl Grey Cheesecake Bars. Last August, I featured Matcha Cheesecake Bars. I decided to modify that recipe using Earl Grey. The result: WOW. 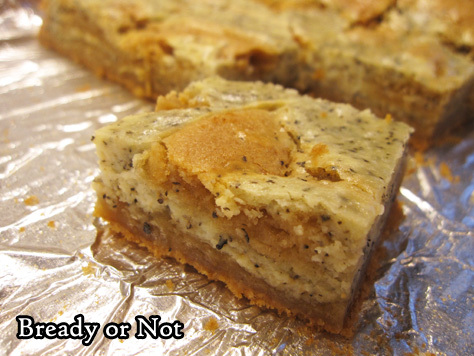 Earl Grey has a slight heat to it when eaten in baked goods (like, say, Earl Grey shortbread). Here, that contrasts wonderfully with the smooth and creamy cheesecake swirls. I’m not a big cheesecake person, but I’m in awe of how good this basic recipe is. This is a recipe to make cheesecake haters love cheesecake. That’s not a statement I’d make lightly. I’ve been told these are excellent with coffee… but if I may, I suggest indulging while enjoying some Earl Grey tea. Hot. Captain Picard-style. This Bready or Not original recipe uses the pleasantly warm spices of Earl Grey to season cool cream cheese. The result is a memorable, delicious recipe that just might convert cheesecake haters to the ways of cheesecake. Preheat oven at 325-degrees. 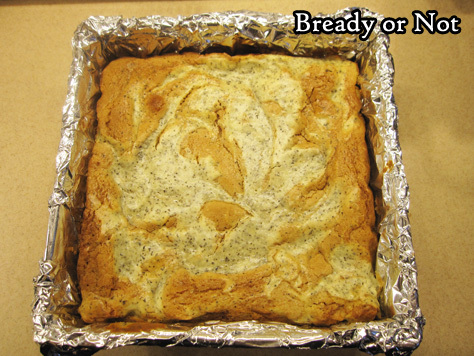 Line an 8x8 or 9x9 pan with aluminum foil and apply nonstick spray. In a medium bowl, sift together the flour, baking powder, and salt. Set aside. In a large mixer bowl, cream together the softened butter and brown sugar for about 3 minutes, until light and fluffy. Add 2 eggs and the vanilla extract, followed by the combined dry ingredients. Use an uneven spatula to smooth out HALF of the batter in the prepared pan. Place the other half in another bowl for now. Clean the bowl before the next stage, if desired. 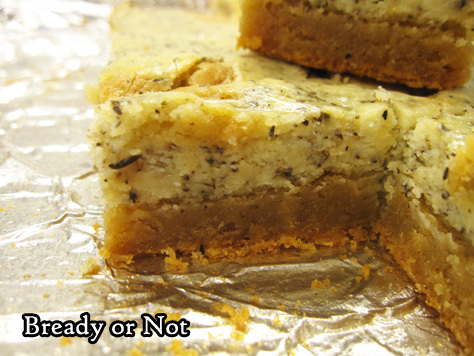 To make the cheesecake layer, beat together the softened cream cheese, sugar, butter, flour, and the contents of two bags of Earl Grey. Mix in the egg and vanilla until it is mostly smooth. 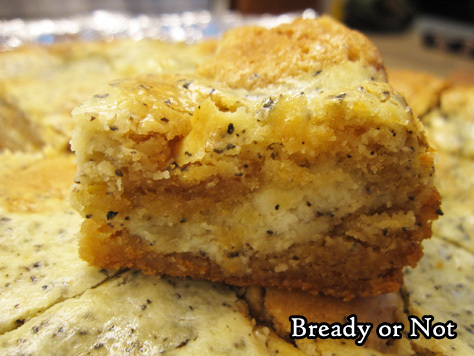 Pour about HALF of the cream cheese mix on top of the batter in the pan and smooth it out. Dollop the remaining crust and cheesecake batters over the top, and use a butter knife to swirl them together. Bake for 45 to 55 minutes, until it passes the toothpick test in the middle. Let cool at room temperature for an hour, then place in fridge to continue to chill and set for another hour or two. 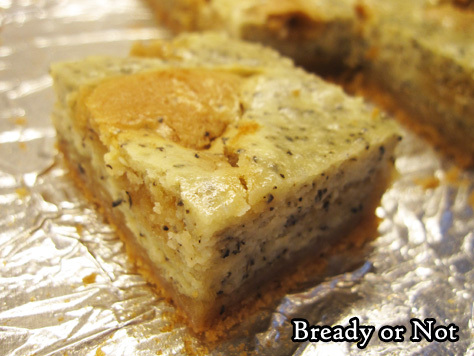 Lift it up by the aluminum foil and place on a cutting board to slice into bars. Store in a lidded container in fridge, with waxed paper or parchment between stacked layers.